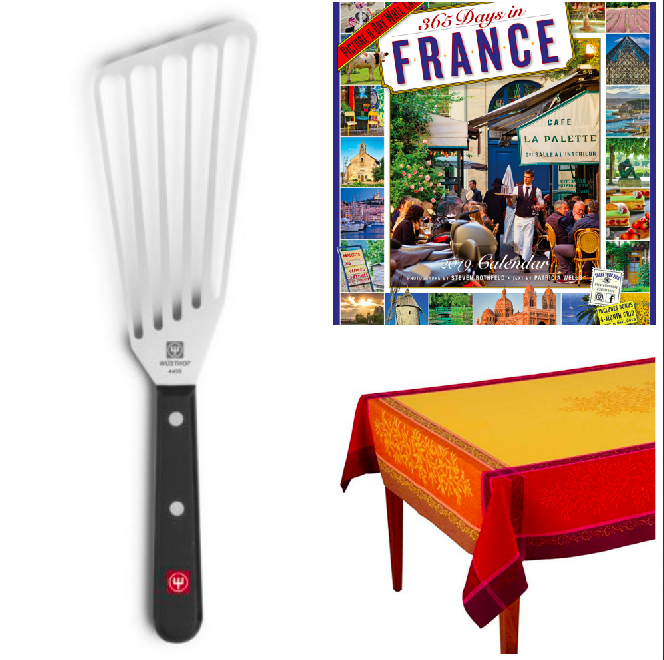 This year’s roundup of great gifts for cooks and lovers of France. Wusthoff Spatula, France Calendar, Jaquard Tablecloth. Greetings, friends. Each year, I unveil my list of the best French gift ideas—gifts for lovers of France (and food). Take a look! And always remember that any purchase you make through one of the links on my site will help support the work I do on this blog. So, if I’ve ever led you to a great recipe, a favorite wine, or a lovely French town, please consider making a purchase through one of my links. Doing so won’t add to your costs in any way! PS: Even if you don’t buy exactly what I’m selling, if you get to Amazon through one of my links, I’ll still get some credit. So go shop! Every year, I get my husband one of these. 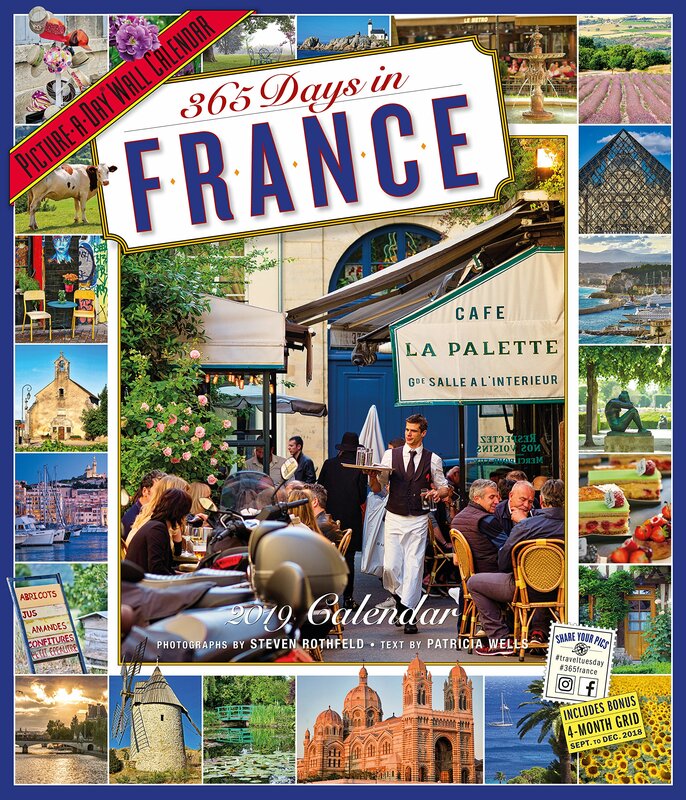 I love love love this calendar, and I have given one to my husband, Mr. Sportcoat, every single year since we’ve been going to France nearly every summer. Each month features a region (e.g., Savoie) or a city (e.g. Marseilles), with representative photos of the month’s highlighted region for every single day. Better yet, the copy is written by Patricia Wells, the famed French-cooking expert and cookbook author. 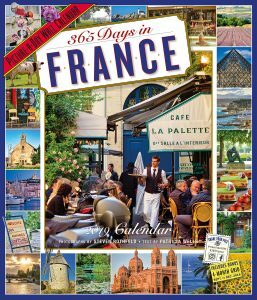 It’s a lovely gift for anyone who loves France, dreams of going to France, or goes to France often. (We love it because we often recognize minutiae of places we’ve been, from little shops and cafes to little-known churches. As of this posting, the calendar is currently $10.99 on Amazon. Jacquard Tablecloth. Rich, elegant, sumptuous colors. For the food-lover, France-lover, and anyone who loves to entertain, give them a beautiful Jacquard tablecloth. What is “Jacquard”? It means the design is woven right into the cloth (rather than printed in). 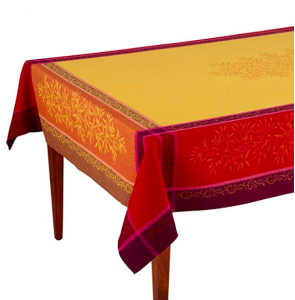 Made in France, imported from Provence, the warm colors are just so rich and sumptuous. Right now on Amazon, the prices range from $109-149, depending on the size. If that’s a little pricey, check out some other designs of lovely French-designed (though made elsewhere) tablecloths. 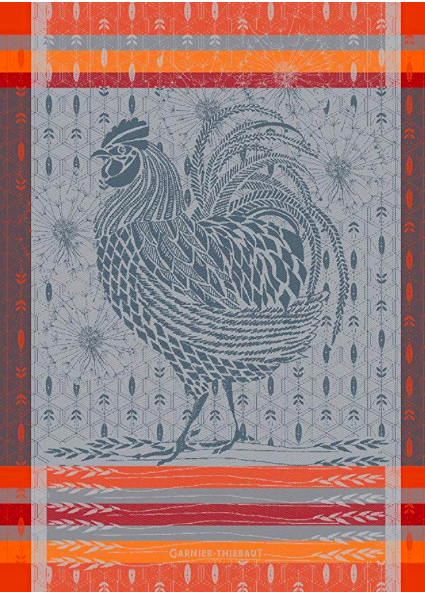 And if you like something a little more whimsical than elegant, take a look at the rooster design of this tablecloth — I appreciate that it’s available in lots of sizes. 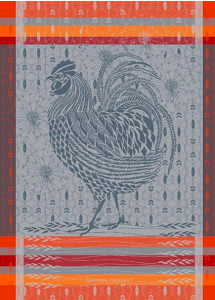 Speaking of roosters, another great option for French Jacquard would be a beautiful tea towel (or two or three) from Garnier Thiebaut. These richly colored towels are not only beautiful to display (they’re unmistakably French! ), but incredibly useful, because they’re absorbent. As of today, they’re $28 on Amazon. You’ll find some lovely designs (rabbit, goose, seafood), but I definitely love the rooster — the enduring symbol of La Belle France. Another fine option for modest gift-giving would be a set of French napkins. Serrated table knives. If you’ve ever dined in France, you know: The French use serrated knives at the table for just about everything except fish. For heaven’s sake, if you don’t already own some elegant French dining knives, get yourself a set. And, while you’re at it, give someone on your list a set, too. Everything from chicken breasts to pot roasts to pizza cuts better with a serrated knife, and that’s why the French use serrated knives at the table for just about everything except fish. So while these might be classified as “steak knives,” once you start using them for everything else, you’ll wonder why you’ve been using flat-edged table-knives for so long. As of right now, they’re $47.99 on Amazon. Oh–and make no mistake. 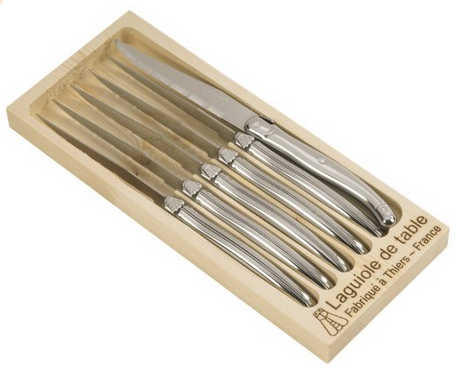 These knifes are truly from France. There are some imitations out there, but these are the real deal. Enjoy a little German craftsmanship with your French cheeses with the Wusthof Gourmet 3-Piece Cheese Knife Set with Cheese Board ($99.95). I especially adore the soft-cheese knife—it’s the one with the holes in in the blade. Use it for washed-rind and bloomy rind cheeses (like Camembert, Epoisse, et al. ); the cheese won’t stick to the knife. The offset knife is stellar for cutting firm and semi-firm cheeses, while the cheese plane lets you cut those ultra-thin slices from favorites like Comté and Gruyère. PS: If you want, you can just purchase the Soft Cheese Knife (currently priced at $89.95), my favorite of the three. But frankly, for $10 more, I’d go for the set. The Le Creuset Braiser. Available in a multitude of legendary colors. I don’t know how I ever lived without my enamel cast-iron braising pans from Le Creuset. Braising is a “low and slow” cooking method for transforming less-expensive cuts of meat into rich, succulent meals. Coq au Vin, Boeuf Bourguigon, Blanquette of Pork, Osso Bucco are all braises, as are a slew of great everyday recipes, like pot roast and beef stew. With its tight-fitting lid, wide base, and shallower-than-a-Dutch-oven sides, the braising pan is simply the best choice for this cooking method. As I write this (12/2018), they’re currently priced around $265 for the 3 3/4-quart braiser, or $339 for the 5-quart braiser. Which one should you buy? If you usually cook for four to six people, get the 3 3/4-quart braiser. If you generally cook for six to eight, go for the 5-quart braiser. It might not be called a braiser, but the Lodge Color Enameled Cast Iron 3-Quart Covered Casserole works just like a braiser—I’ve tested one and give it a hearty thumbs up. So, if you don’t want to splurge for French pedigree with the Le Creuset, I can recommend this braiser. It’s made of enamel cast-iron, just like the French pans; see my review for more information. It’s designed by an well-respected American company and made in China. PS: While there aren’t as many colors as there are for Le Creuset, both the Blue braiser the red braiser are lovely. Both cost $59.90 as of this writing. I know. I’m blowing my own horn here. But if you have a food and France lover on your list, please consider giving them a copy of my book, The Bonne Femme Cookbook: Simple, Splendid Food That French Women Cook Every Day. Now in its third printing, the book continues to be a guiding light for those who want to bring French joie-de-vivre to the table, but don’t have all day to do so. It showcases a fresh, simple, modern approach to French cooking—an approach I discovered through many summers living and cooking in France. I’m especially honored that Publisher’s Weekly called it “a good read”—there are a lot of vignettes about how I discovered everyday French cooking. But don’t take my word for it! Check out the reviews on Amazon.com. You do not need a “crêpe pan” to make crêpes. A nonstick skillet with flared sides will do just fine. I love my T-Fal skillet; in fact, I am on my third skillet (they last a long time but one finally wore out after 15 years, and I misplaced the other one when doing a crêpe demo off-site recently). These non-stick skillets with flared sides are perfect for making crêpes and French omelets (and many other French and non-French things). I also highly recommend a small Le Creuset silicone spatula for flipping the crêpes. And if your recipient needs a crêpe book, I’ve purveyed a very popular one. (Of course, the Bonne Femme Cookbook has plenty of crêpe recipes in it as well!). Finally, why not throw in a bottle of high-quality chocolate sauce for topping the crêpes?